While I was cat sitting I thought I would pick up some more gear from Grasby. To get it back on board I needed to be able to get the car as close as possible. From Southrey I headed for Bardney mooring. A wild life morning. I spotted a small deer on the starboard side – that’s the right hand one – but it swiftly disappeared. 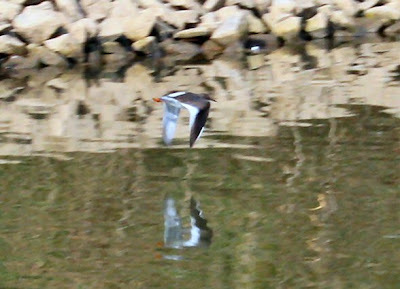 One bird I have seen a lot of is the Redshank. One very rarely gets close to it but it soon lets you know how disgruntled it is with being disturbed. The view you usually get of it is just the dashing flight as it vanishes away from the boat. 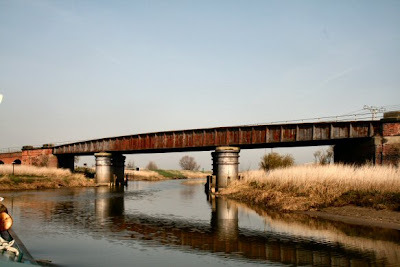 The mooring at Bardney is quiet but a bit remote from the road and the footpath which runs next to the canal has a gate on the end of it that is chained. Along side the footpath there is still evidence of the railway line. Sleepers and rails are still to be found and there is a solitary chimney stack standing which is all that is left of a bothy. A mile further on is the lock and I know there were cars here so that was the next port of call. Access to the lock is a sharp left hander under the old railway bridge. Immediately in front of you at this point is the old course of the River Withern. Along that route there is a marina and caravan park. Through the lock and whilst in the lock used the facilities all of which are next to the Lockkeepers cottage. 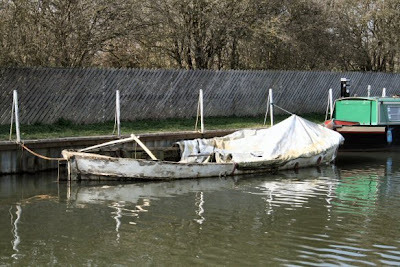 Moved along the line of moored boats and noticed a restoration project. While I am all in favour of a restoration I feel that this time someone might have bitten off more that anyone can chew. Most of the wood seems to be rotten and the boat is full of water. The best of luck. I have my favourite assistant onboard this evening to help with the polishing.